Autumn is literally just around the corner and I am so excited to get my cosy knits on, boots, duffle coat and drink hot mugs of tea and chocolate and it's also the perfect time to get your hygge on! With all that in mind it makes the perfect climate for reading and I have rounded up some the books out this Autumn that I cannot wait to snuggle down and read. I have created a little list of some of the books you should be reading this autumn. 1. Tarnished City by Victoria James- Out Now I have actually been lucky enough to already read this book after winning an advance copy in a competition. This is the second book in The Dark Gifts Trilogy and dare I say I thought it was even better than the first? If you aren't familiar with this trilogy, it is set in modern day England, where the magically skilled aristocrats rule and the 'commoners' must serve 10 years of their lives as slaves as repayment to them. This had hints of The Hunger Games to it and I found it fascinating. Now to wait for book three. 2. The Little Book of Lykke by Meik Wiking- out now I was absolutely delighted when I heard that Meik Wiking was releasing a new book. I completely fell in love with The Little Book of Hygge when it came out last year, so it was a lovely surprise to see this beautiful little book out. This was another eye-opening and fascinating book from Meik, who if you didn't already know is the CEO of The Happiness Research Institute. He is committed to understanding happiness and this book was such a captivating read on the things that can impact our happiness but we may not realise it. Ok so this isn't YA, but recently just finished it and had to share! 3. The Book of Dust by Phillip Pullman- 19th October Not completely in love with the cover, but it's been AGES since Phillip Pullman released a book and His Dark Materials series had me enamoured when I was 12- not in 1995 I will just add. The Book of Dust is set ten years before The Northern Lights, although it isn't a prequel, Philip Pullman has described it as equel - a new story that stands beside his previous trilogy and it is in three parts! I have it on pre-order already 4. A Shiver of Snow and Sky by Lisa Lueddecke- 5th October I have been looking forward to this book since the beginning of this year, so I was over the moon when I received an advanced copy.Set on the frozen island of Skane, the sky speaks. Beautiful lights appear on clear nights, and their colours have meaning: Green means all is well, and the Goddess is happy. Blue means a snow storm is on the way. And then there's red. Red is rare. A warning 5. The Loneliest Girl in the Universe by Lauren James - Out Now As I write this I am literally half way through and I cannot get enough of this book. I don't know what has been wrong with me this year, but very few books have been grabbing my attention, but I got this one in the post the other day, decided to start reading a bit and instantly became hooked. This is about a girl called Romy who is has been in space for 19 years as she makes her way to Earth 2. The only communication she has with Earth is via audio scripts that take 2 years to arrive, that is until it's announced a new, faster spaceship is coming her way with a boy called J. But what does Romy really know about him and what are the strange messages coming from earth? 6. The Treatment by C.L.Taylor - 19th October I am a HUGE fan of C.L.Taylor's books. I always get really excited when a new one comes out and you can imagine my excitement when she not only had a new book coming out but a YA one at that! I have already read a few pages of this one and I am already hooked- this is going to be another fantastic thriller from C.L. Taylor. 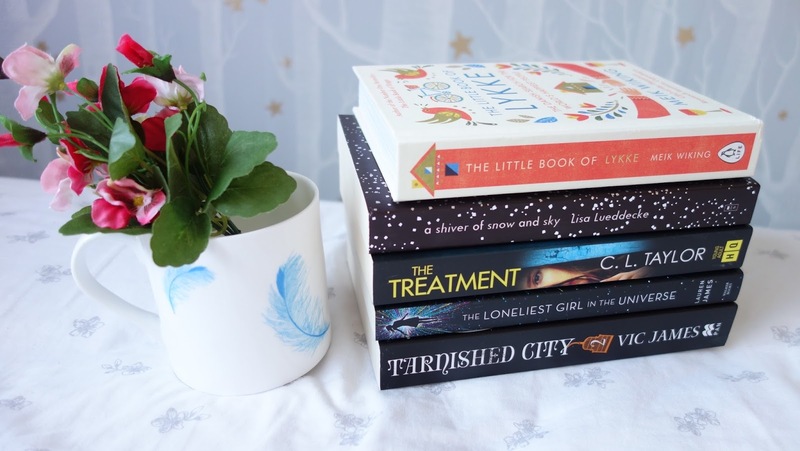 These are just a snapshot of the YA books you can cosy up with the Autumn.